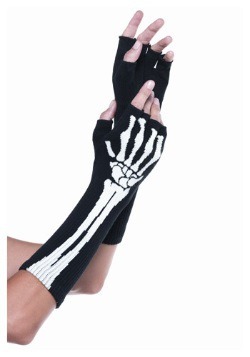 Have you ever realized that a classic skeleton costume just works for every occasion? 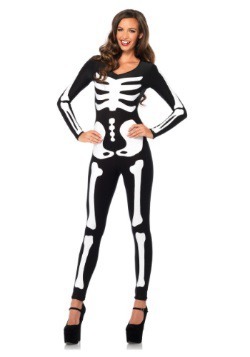 Really, name one costume party that you can't pull off with a simple back-to-basics, bones-on-black printed jumpsuit? There isn't one that comes to mind for us! We know you're a busy gal, so when the next party invite comes in, don't get your ribs in a twist—throw on this Plus Size Cozy Skeleton Costume and you'll be ready, no matter what! Don’t believe us? Try it out and see for yourself! Ok, so technically, it won't work for every occasion. There are some instances in which a classic skeleton print won't get you on the best-dressed list (but that doesn't mean you can't try!). 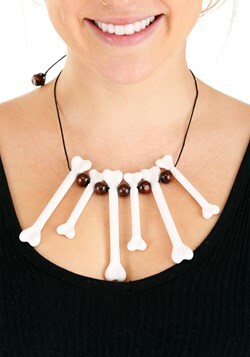 We wouldn't advise wearing this for, say, a trip to the opera or a black tie wedding. 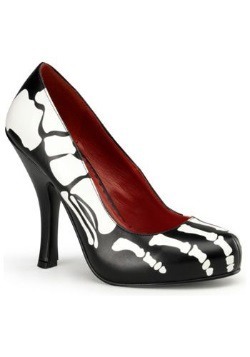 But with this hooded dress on, even if you’re caught in a last minute costume competition, you're covered from skull to tarsal! This hoodie dress is made of fleecy fabric and features a full-length separating front zipper. On the front is your printed skeleton, and it features all the most important bones—like ulna, radius, clavicle, and pelvis! On top of the hood are appliqued eyes and nose to imitate the skull. The fabric is soft and comfortable and is guaranteed to send shivers down the spines of anyone who gets a chance to see you in it! 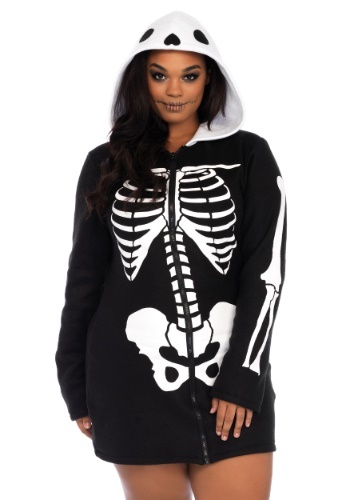 Seeing how your bones give structure to your body, it's totally appropriate that this hoodie forms the foundation for a totally spooky look. Maybe ring your eyes in black and paint your lips to match. Maybe walk around with a bowl of peeled grapes and tell folks they're eyes. Go all out! 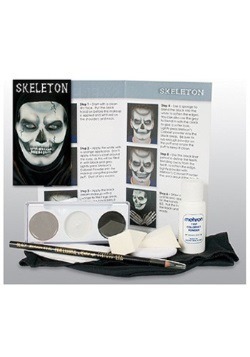 Because at the heart of this look is a costume classic that cannot fail!